Isaac’s mother was a prayer warrior. She had prayed for her son faithfully since the moment she discovered she was pregnant. Though he was born two months premature and doctors gave him no hope, Isaac’s mother continued to pray for him. Isaac was healthy when he went home three months after he was born, and this only deepened his mom’s belief that prayer mattered. She continued to pray for him daily as the years passed. When Isaac started attending a public high school, his mother worried about him. The science teacher was about to start a unit on evolution. Isaac’s mother wondered how she could pray for her son during this time. That’s when she stumbled across Ephesians 6:19. 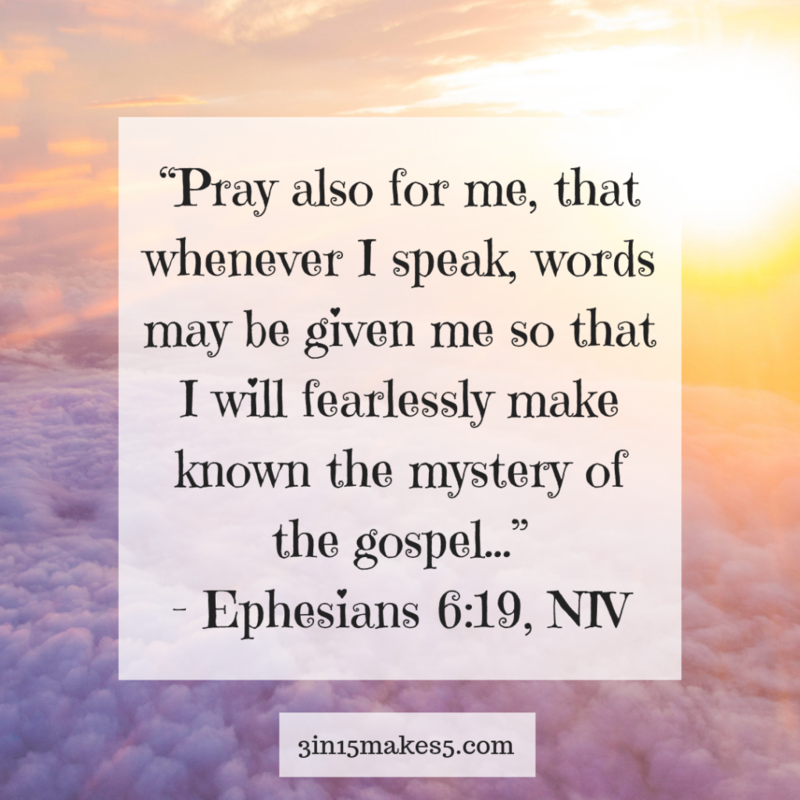 While Paul was imprisoned, he asked the Christians in Ephesus to pray for him, particularly that he would boldly speak about the Gospel. Regardless of the year, location, or country you live in, it’s hard to stand up for what you believe in! But don’t let the fear of what someone else might say or do prevent you from sharing the truth. You can offer Biblical viewpoints from a place of love and grace. Lord, give me the courage to speak up when I should. Guide my words so that love, grace, and mercy flow from them. Let me be kind and respectful towards everyone, even if they don’t share my views. In Jesus’ name, Amen.